More than a thousand years ago, the Danish king Harald Gormsson united the feuding tribes of Denmark and Norway into a single nation. Known as “Bluetooth” because of at least one conspicuously decayed tooth, the king was able to connect different groups of people and ideas to work for a common goal. Almost exactly a thousand years after his reign ended, in 1989, a Swedish company took the name of this great king and applied it to their newest product, a technological advancement that allowed different devices to connect with each other and share information. Bluetooth technology allows compatible devices to communicate wirelessly over short distances. Personal devices like phones, laptops, and tablets—as well as things like fitness trackers, cars, and even some pairs of smart shoes—can be connected via Bluetooth, and the resulting ease of communication will help you make sure that your daily routine is synced up as tightly as possible. Using a Bluetooth adapter can help you stay connected to your friends and family on multiple devices. It can help you work remotely, keep information updated, and stay ahead of all the tasks and the responsibilities that you handle on a day to day basis. If you want to connect your computer to other Bluetooth-compatible devices, but your computer doesn’t come with Bluetooth already equipped, you may want to look for an adapter. This will let you convert any computer with a USB connection into a Bluetooth-ready device that can connect effortlessly to your phone, your tablet, your printer, or any other devices. A Bluetooth adapter is any USB-based device that can be plugged into an ordinary PC. Usually, a USB or PC Bluetooth adapter is designed to be used with a wireless mouse or wireless keyboard, but it can be used to transmit and receive Bluetooth signals from nearly any device. Adapters are usually quite small, and don’t take up very much space at all on your laptop or computer. At the most, the average adapter will protrude only half an inch or so from the USB port. Sometimes, Bluetooth adapters are referred to as Bluetooth dongles. A dongle is generally just a catch-all term for any small plug-in that sticks out of the socket and doesn’t use a cable. To use an adapter, find the adapter that will work for your specific laptop or desktop computer, and simply plug the adapter into one of your computer’s USB ports. If your computer prompts you to download or install any drivers that come with the adapter, follow the instructions on screen to get your adapter set up. Once you’ve finished this step, it’s time to sync up any compatible devices! If you’re using a wireless mouse, for example, turn the mouse on. Some devices will have a separate button to start pairing with the Bluetooth adapter, but most devices will automatically go into pairing mode as soon as they’re turned on. On your computer, you should be able to access a Bluetooth settings page under your general settings or system preferences page. Look for available devices to add, and find the listing that fits your mouse or printer or other paired devices. Once your device is fully paired, you should be able to use it with no problems! 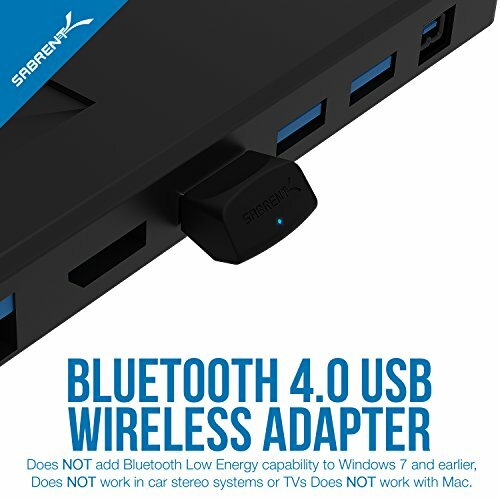 The main thing to look for in a Bluetooth adapter is compatibility with your computer. Make sure that your adapter was designed for your computer’s make and operating system, and also that it’s a good physical size for your space. The Avantree DG40S USB Bluetooth 4.0 Adapter Dongle is a Bluetooth adapter that can handle pretty much anything your computer can throw at it. Compatible with Skype, most music players, wireless mouses, keyboards, and headphones, the Avantree adapter is designed to work with all Windows operating systems, and comes with a two-year warranty. The high compatibility makes this a versatile tool, and the “plug and play” design means that the adapter will automatically install the drivers that it needs, which saves you a few steps during the start-up process. The two-year warranty also includes 24/7 tech support, so you can be certain that Avantree tech experts will be happy to answer any questions you may have. This adapter is compatible with any Windows computer, but Apple users may need to look for a different plug-in. Some customers have also expressed their disappointment with the actual look of the driver and settings menu, complaining that it feels outdated or old-fashioned. In addition, it works best when plugged into one computer—swapping the adapter between different PCs leads to a drop in functionality. 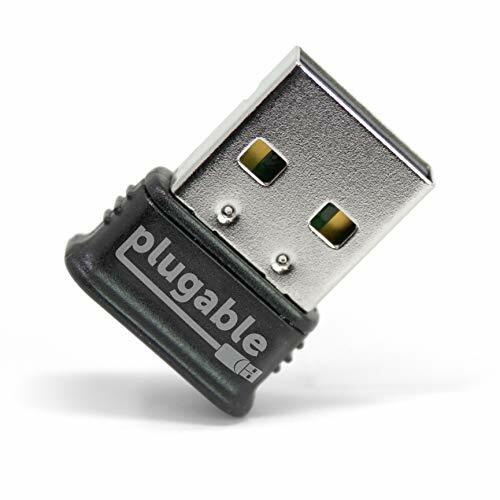 Unlike the previous entry, the Plugable USB Bluetooth 4.0 Low Energy Micro Adapter is compatible with Windows, Linux, and even Raspberry Pi processors, which makes this adapter the best USB Bluetooth adapter for people with different operating systems. It also features a design that’s even smaller than the usual adapter size, so that the finished product is as streamlined and unobtrusive as possible! As mentioned above, this adapter is compatible with more than just Windows OS, which can be a major plus for people looking for a less common fit. It supports most wireless headphones, speakers, headsets, keyboards, mice, and phones, and the small design makes it a great choice for people who want to make sure that their adapter isn’t taking up too much extra space. If you’re using wireless headphones with this adapter, some users have reported hearing a “hiccuping” sound when listening to music or other media. However, this seems to be a problem mostly with media-playing applications, so if you’re not planning on listening to a lot of music at work, it shouldn’t be too much of an issue. 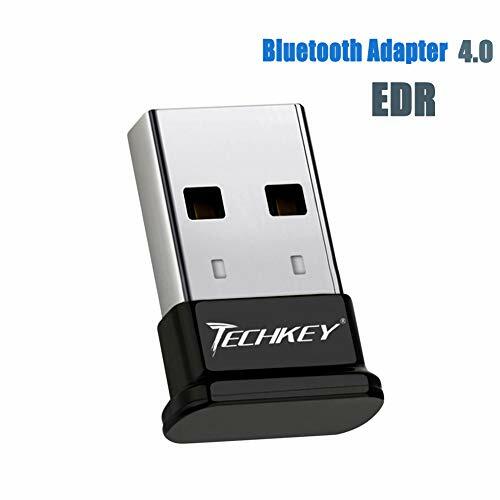 The TECHKEY Bluetooth Adapter is another great adapter that works with any Windows, Linux, or Raspberry Pi operating system, and can connect to most speakers, headphones, headsets, keyboards, and mice. Like the Avantree adapter, this Bluetooth dongle automatically installs and updates its own driver, so you don’t have to worry about those extra steps while you’re still getting set up! Like some of the other entries on this list, the TECHKEY adapter works to connect multiple devices at the same time—not just your computer and your mouse, but computers, mice, keyboards, video game systems, and headphones all at once! Up to seven devices can be connected simultaneously, and its high compatibility makes this adapter a great fit for people who have a lot that they need to get done on multiple devices. The biggest complaint other customers have raised with this adapter seems to be its music-playing abilities. The adapter sometimes struggles to play music for long amounts of time, and may disconnect or break the wireless connection after an extended period of time without breaks or pauses in media streaming. The second Avantree adapter on this list, the Avantree Dedicated Windows 10 Bluetooth USB Adapter is a great choice for people who need to sync up multiple devices. 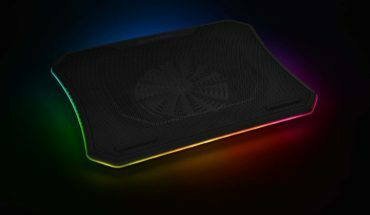 It’s specifically designed with gaming in mind, as this adapter can support controllers, headphones, keyboards, and pretty much everything you’ll need to connect with your friends and family online or in person! Like most of the adapters on this list, the Avantree adapter works with the usual devices, but this specific adapter can also be synced with your phone for a greater connection between all your main interfaces. 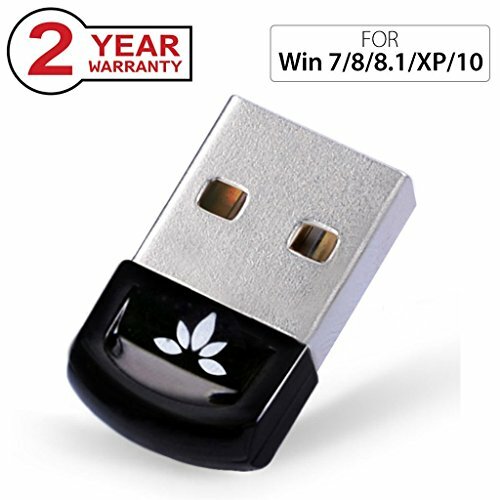 Again, the two-year warranty with guaranteed tech support is a major plus in this adapter’s favor, as it can help during the set-up process as well as with any questions or issues that may arise after the fact. 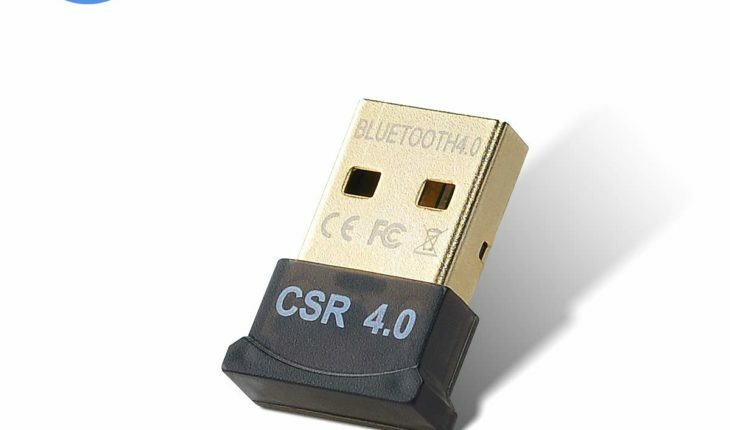 Again, as with the previous Avantree adapter, this dongle is meant to be used with Windows computers. If you are using a Linux or Raspberry Pi operating system, check out some of the other entries on this list or try searching for adapters that were specifically designed for that OS. 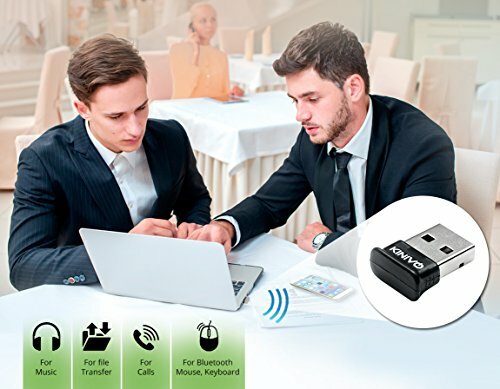 The Kinivo BTD-400 Bluetooth 4.0 Low Energy USB Adapter is a slightly more heavy-duty adapter that works with all Windows, Linux, and Raspberry Pi operating systems to connect your phone, printer, mouse, or keyboard. The same plug and play programming that appears elsewhere on this list helps the Kinivo ease its own installation, and saves you the time and headache that an additional download would have caused. The low energy design of this adapter doesn’t pull too much power from your PC, which can be really helpful if you’re working from a laptop and don’t want to worry about battery drain. Multiple devices with different profiles can be connected simultaneously (one set of headphones + one mouse + one keyboard + one cell phone, for example), and the Kinivo adapter overcomes the usual Bluetooth media issue to stream music or video without any problems! Connecting multiple devices with the same profile (two sets of headphones or two cell phones) is not within this adapter’s capabilities, and some customers have reported issues with the black casing on the adapter falling off after extended periods of use. 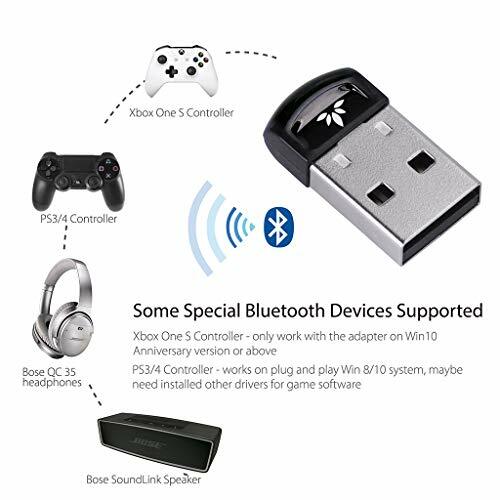 The Bluetooth Adapter for PC QGOO USB Dongle earns its spot on this list by having an advanced transfer rate that allows you to share large files between connected devices. Beyond that, this adapter is compatible with Windows and Windows Vista operating systems, and the extra compact design means that it won’t take up too much space or block the USB drives around the one currently being used. Another great low energy option, the Bluetooth Adapter for PC QGOO USB Dongle won’t drain your laptop’s computer, even as it provides a high transfer rate of up to 3 megabits of data per second. This adapter is compatible with printers and other usual devices, but can also connect to everything from headphones to scrap-booking machines! In addition, the sound quality is above that of the average Bluetooth adapter. Unfortunately, this adapter is only compatible with Windows devices, and even some of the older Windows operating systems may have some issues with connection. Check to make sure that your computer is on the approved list of systems before attempting to plug in and use this adapter. 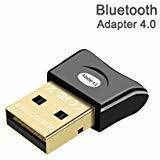 The last entry on this list, the Sabrent USB Bluetooth 4.0 Micro Adapter is still one of the best USB Bluetooth adapter choices available today. Low energy and highly compatible, the Sabrent adapter works with most Windows devices and lets you connect to pretty much any Bluetooth-compatible device that you need to use! The adapter boosts the internet connection on any synced devices, so that you’ll be able to use internet on your phone when it’s linked to your computer via the Sabrent adapter. In addition, while it’s still a small, streamlined design, the Sabrent adapter features a small LED light that indicates when the adapter is connected and in use, so that you’ll be able to see your connectivity at a glance. Some customers have expressed irritation at this adapter’s notification system, which can be a little bit distracting while you’re trying to get work done. In addition, you may want to skip the included driver and just use the generic Windows driver software during the setup, as some have found the included software overly complicated and frustrating. Ultimately, the best USB Bluetooth adapter is one that fits your computer, your personal preferences, and the time and space that you have available. This list of the seven best USB Bluetooth adapter choices available isn’t meant to be a be-all, end-all list, but it should give you a starting point to explore your options. The adapters listed above are some of the best USB Bluetooth adapter choices on the market today, and they should give you the confidence to find the perfect fit for your computer.